I can't think wif all the squeeeeeeing going on here. Sheesh Mom. Be easy, will ya? I have fangs too ya know. Your sweet face is just too much, Maxie! Have to agree with Summer. Are you related to Dracula? 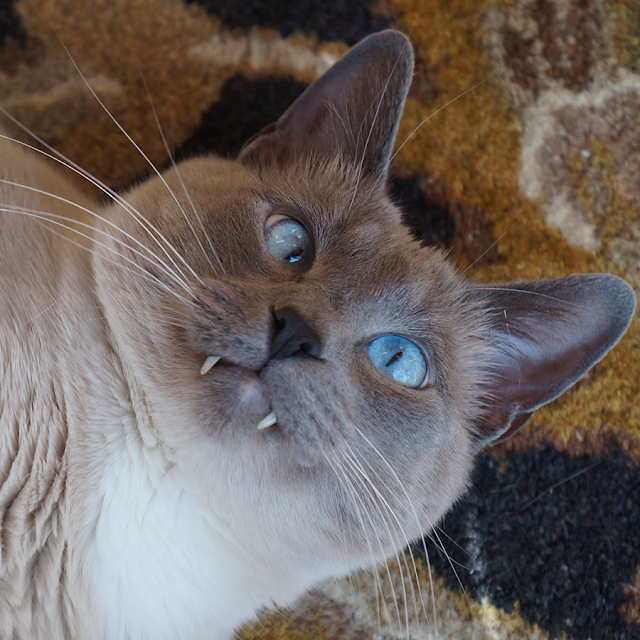 Whiskers fangs and drop dead gprgeous blue eyes! Maxwell you outfanged pretty well every kitty!! So cool! You are just way too cute! Stop it! You had the best fangs Maxwell. Oh my Cod you're cute! I like the Swiss Cats' comment....fang-tastic! Fangtabulous!! If you were not so cute, we might be scared, MOL!! Brotherly - ahh - Advice? We Review the July CatLadyBox!